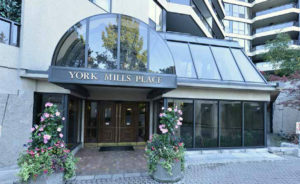 York Mills Place speaks of quiet elegance. The beautifully landscaped gardens, reflecting pond, and natural woodlands provides a peaceful setting to relax. This most sought after condominium is situated within easy walking distance to the subway, shops and a assortment of dining experiences. This large gracious suite enjoys an easterly view and inviting tiled patio. There are 3 large bedrooms, 3 bathrooms, updated eat-in kitchen and grand foyer.